The NASA Lunar Reconnaissance Orbiter rolled to capture this dramatic oblique view of the Apollo 15 landing site. 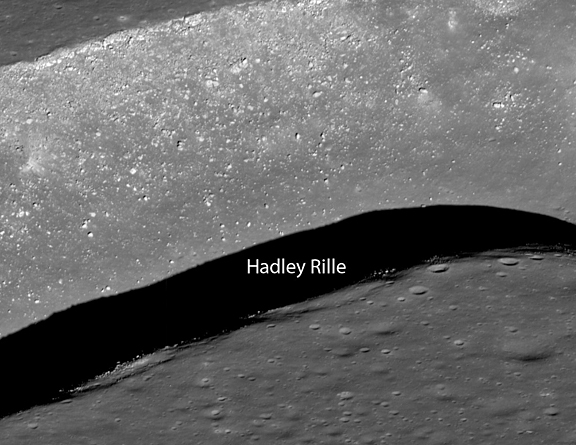 Hadley rille, a great chasm in the lunar surface, carves its way through the center of this scene [NASA/GSFC/Arizona State University]. Larger Image. After being on hiatus for a few months the Lunar Orbiter Image Recovery Project (LOIRP) will soon be back in action retrieving imagery from original Lunar Orbiter program data tapes and vintage tape drives that we have restored and enhanced. Armed with new software that will greatly enhance our image recovery process and other improvements, we should be able to produce new versions of original Lunar Orbiter imagery on a regular basis. Of course, we’ll be posting all of it here. The “Apollo Zone” Digital Image Mosaic (DIM) and Digital Elevation Model (DEM) have just been released. These maps cover approx. 18% of the Lunar surface at a resolution of 1024 pixels per degree (approx 30 m/pixel). The maps are the result of 3 years worth of work by the ARC Intelligent Robotics Group (IRG) to align and process more than 4,000 images from the Apollo Metric (Mapping) Camera, which flew aboard Apollo 15, 16, and 17. Once you open that file in Google Earth you will have options to view these “Apollo Zone” maps overlaid on Google Earth’s “Moon mode”. The maps have also been uploaded to the Lunar Mapping and Modeling Project (LMMP) portal (http://lmmp.nasa.gov) and will soon be available for visualization and download via that site. The “Apollo Zone” maps cover the following sites of interest: Apollo 15, Apollo 16, Alphonsus Crater, Rima Prinz, Aristarchus Plateau-2, Ina D Caldera, Sulpicius Gallus, Mare Crisium, Mare Smythii, King Crater, Tsiolkovskiy Crater, Aitken Crater, and half of Van de Graaf Crater. The terrain model has an average vertical accuracy of 40 m/pixel and standard deviation of 37 m (compared to LOLA laser altimetry tracks). Over 46% of the covered surface has vertical errors lower than 25 m.
– photometric correction of exposure time, shadow removal and generation of seamless large-scale image mosaics. These algorithms have been released as NASA open-source (Ames Stereo Pipeline, Neo-Geography Toolkit, and NASA Vision Workbench). Map processing was performed using the NASA Pleiades supercomputer. 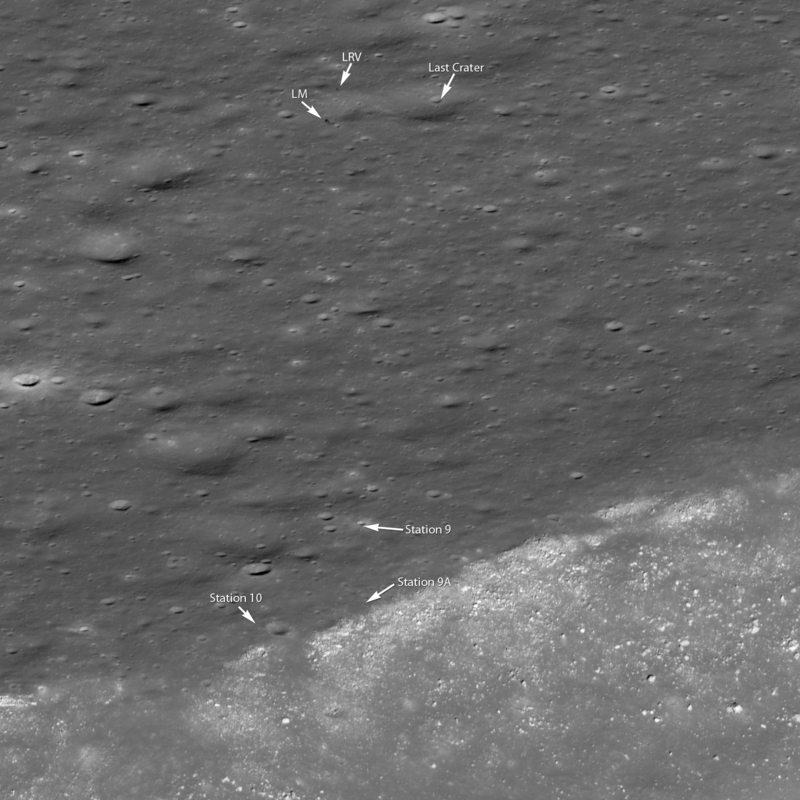 In addition to the Apollo Metric Camera images, the fully automatic map processing pipeline has also been used with data from the Lunar Reconnaissance Orbiter Camera (LROC) and by several planetary science groups. This work was funded by the Lunar Mapping and Modeling Project (LMMP). We gratefully acknowledge the support of our collaborators at NASA MSFC, NASA GSFC, JPL and USGS. Special thanks go to Ray French and Mark Nall for their support and leadership of LMMP. On 20 July 2011 (coincidentally, the 42nd anniversary of the first steps humans took on another world) the NASA Lunar Reconnaissance Orbiter was commanded to roll to the east, allowing the Lunar Reconnaissance Orbiter Camera to obliquely observe Hadley rille and the Apollo 15 landing site. One of humanity’s greatest voyages of exploration, the adventures of mission commander David Scott, lunar module pilot James Irwin, and command module pilot Al Worden transformed our understanding of the Moon and the Solar System. The shadow of the descent stage of the Lunar Module Falcon is visible, as is that of NASA’s first lunar roving vehicle. Additionally, the sampling stations explored by the Apollo 15 astronauts are easy to pick out. Apollo 15 was the first of three long-duration “J-missions”; more would have flown had the Apollo program not been brought to a premature conclusion in 1972 after the Apollo 17 mission. The J-missions featured heavily instrumented command and service modules, improved spacesuits to promote crew agility, upgraded lunar landing vehicles, and the electric Lunar Roving Vehicles (or LRVs) to expand the crew’s range on the surface. Prior to the mission, the Apollo 15 crew received extensive geoscience training, which (along with the increasingly capable hardware) resulted in an extraordinary bounty of scientific results. Apollo 15 was also the only lunar mission where all crewmembers were graduates of the University of Michigan and United States Air Force officers (the lunar module, Falcon, was named after the mascot of the United States Air Force Academy, and the Apollo 15 command module Endeavour is now on permanent display at the National Museum of the U. S. Air Force in Dayton, OH). Astronauts Scott and Irwin spent almost three days exploring the Hadley-Apennine valley, traversed over 28 kilometers (17 miles) using the first lunar rover, and collected over 77 kilograms (170 pounds) of priceless lunar materials, including the famous “Genesis Rock”, a piece of the primordial lunar crust. While Scott and Irwin explored the surface, command module pilot Worden used the extensive instrument suite aboard the command module Endeavour to successfully complete a complex series of orbital observations. You can view digital scans of the original Apollo 15 flight films taken by Endeavour’s Fairchild Mapping Camera at the Arizona State University Apollo Digital Image Archive! 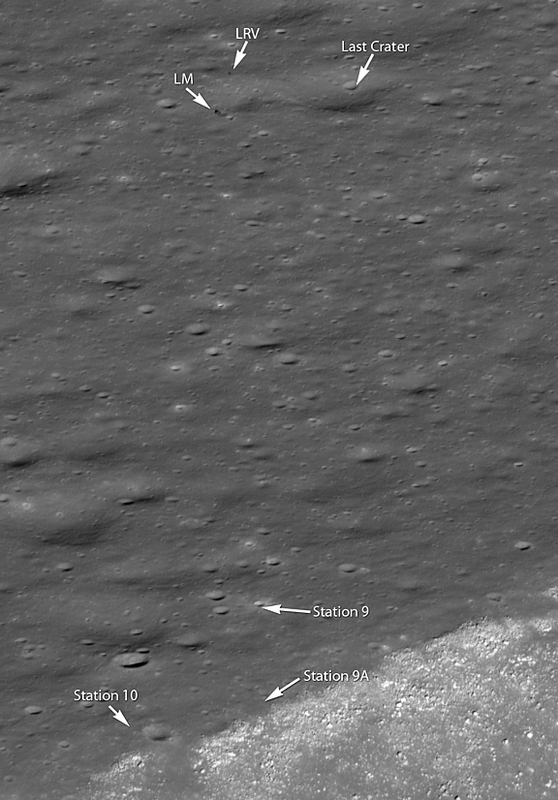 The geologically complex Apollo 15 site is a high priority target for future human lunar exploration, and consequently was one of the Constellation Regions of Interest that were a focus of LROC observations during the LRO Exploration Systems Mission Directorate mission (the 1st year of LRO operations). Thanks to the exploration of the Apollo 15 astronauts, we now have a well-defined set of scientific questions that can only be addressed through a future human sortie mission to the Hadley-Apennine region. In addition, recovering materials from the descent stage of Falcon would provide valuable information to present-day engineers about how materials survive on the lunar surface for long periods of time.